One of the first things I like to teach my children is the Alphabet Song. I started working with my four year old on it a few months ago. I recently discovered a new tool to help me teach the Alphabet Song to my kids. 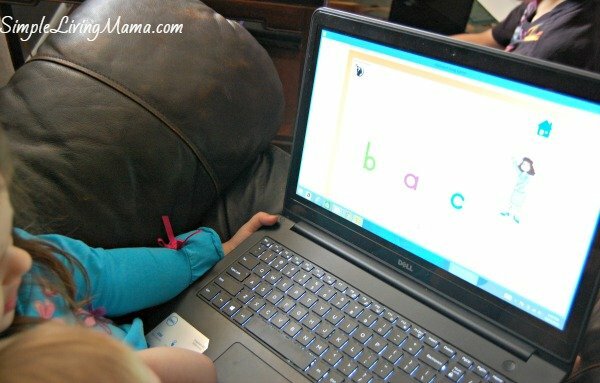 It’s called the Alphabet Song Game from The Critical Thinking Co. and it’s been a great addition to our homeschool routine. What is the Alphabet Song Game? The Alphabet Song Game includes 22 games that help children learn the alphabet. You download the game to your computer and let your child play. Your child will learn both the uppercase and lowercase letter names and shapes, as well as learn to distinguish between letters that look similar, mirrored letters, and reversed letters. Toddlers to children in first grade will enjoy the fun song and clicking on the letters in the correct order. I used this program with my four year old daughter, Sis. It is a game that is played on the computer, so we used my laptop and she had 15 minutes of screen time three times per week. I had not formally began working on the alphabet with Sis, so she had little experience with the Alphabet Song before starting. Our computer has a touchscreen, so she did not even need to know how to use a mouse. Your child would need to know how to use a mouse if your computer does not have a touchscreen. Each lesson begins with the child singing the ABCs with the animated lady on the screen. The letters are displayed on a line while they are being sung so the child gets to hear the letter name and see how it looks. Each lesson gets progressively more difficult. The first nine lessons are strictly about learning the uppercase letters, the next nine are about learning the lowercase letters, and the last four are a combination of lowercase and uppercase letters. The earlier lessons have only two or three choices for answers for the child to choose from, and the harder lessons have up to six choices including reversed and mirrored letters. Your child will click on letters in the correct order and case. The game is a simple concept, but it works. My daughter was singing the Alphabet Song in no time. The repetition of the lessons really helps to reinforce the correct shapes and names of the letters also. My daughter does have a short attention span, so it was difficult for her to sit through an entire lesson without getting antsy. I made sure to sit down with her and help her along. The only issue I had with the program was that sometimes it wouldn’t load when I clicked the icon on my computer. I would have to close out the program and restart it. I’m not sure if it was the program or my computer, though. 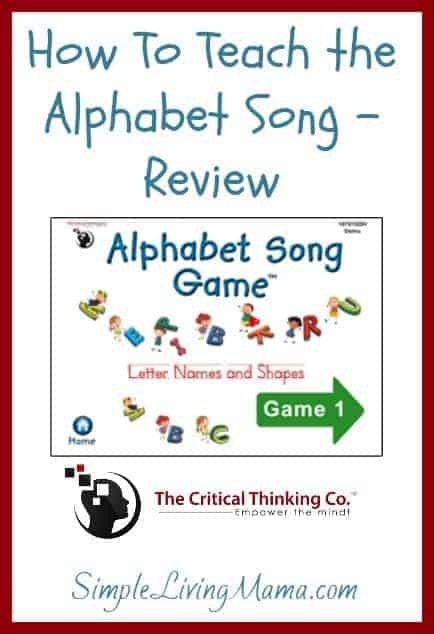 Overall, I am very happy with the Alphabet Song Game and I love having another resource to help me teach my children the alphabet. It’s also great for the kids’ screen time. It’s not online, so I don’t have to worry about them wandering somewhere else on the Internet. It’s just one program right on my desktop. We are happy and my four year old is well on her way to learning the alphabet by heart!